After having been featured in Architectural Digest and constantly being honored by Conde Nast Traveler as one of the best hotels in Chiang Mai, Howie’s Homestay can add yet another feather in its cap. This lovely private boutique villa has made it to Hotel Lust’s list of the 100 most beautiful hotels in the world. It’s easy to see why Howie’s Homestay is so highly acclaimed. First of all, it’s beautiful. Set in beautifully landscaped tropical gardens, this private resort villa is in the same area as the Four Seasons Chiang Mai—right in the Mae Rim valley on the foothills of the Himalayas, just 20 minutes from the airport and even closer to the city centre. 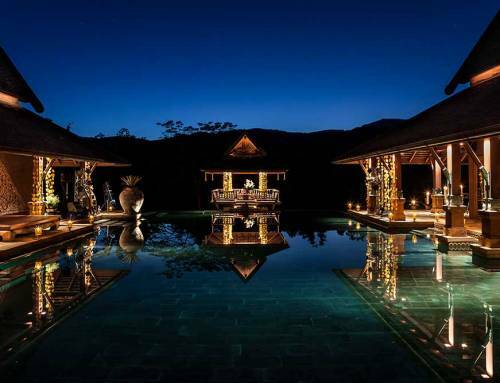 In the property is a lovely dining pavilion, living room, Family Suite pavilion with 3 bedrooms and a dining room, and the legendary Teak Pavilion. Guests likewise enjoy a stunning infinity pool all to themselves, plus an all-inclusive (all meals included) arrangement that makes a holiday truly stress-free. The beauty of Howie’s Homestay also lies in its exclusivity. The resort allows only one group or family in residence at any one time. Staying here—where you are the ONLY guest—means enjoying complete privacy in a picturesque 5-star private boutique resort. The staff is at your beck and call, and everything moves on your schedule. Tour assistance is also offered so you can see Chiang Mai in luxury.